Playing Indian Rummy Online has deep roots in our history. Be it family gatherings, functions, or get-togethers card games have always been associated with Indians since time memorial. Playing rummy brings joy and enthusiasm and the fun just doubles when you play with your near and dear ones. Technology has transformed the way we live and the way we play rummy. In the earlier days, we’d have to wait for someone to join us in our tables. Now with the advent of technology and with an uninterrupted internet connection, you may now connect with millions of rummy enthusiasts nationwide. Not only is playing Indian rummy online exciting but also very rewarding. Just imagine the fun of playing the game of your choice at the comfort of your home? Yes, keep playing on your mobile, desktop, laptop or any device. Make your free time more productive with playing Indian Rummy game. 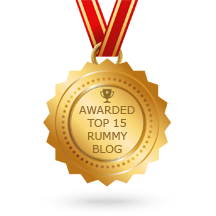 One of the most significant points of playing rummy online is that it helps you beat the stress. In the din and bustle of the outside world, every individual has to carry some stress unwittingly. Whether you own a business or work under someone, stress is something that you cannot overcome easily. Research suggests that indulging in your favorite past time helps you beat stress. Games requiring focus can help lower stress levels. Also, it has been proven games that are based on strategy are more likely to create an impact than games that are merely action oriented. Games that require your full focus and attract your full attention can be played to beat the stress more than adventure games. Truth is because of the busy and noisy outer world, Many of you out there might prefer a sedate experience or in other words a serene pastime. That is where Indian Rummy game online fits to a T. You can unwind unshackle from the stress by playing rummy card game online everyday. 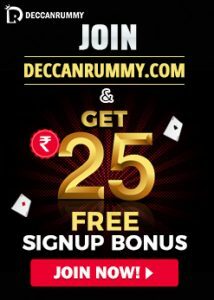 If you are new to rummy online, then Deccan Rummy is the place you need to go about. 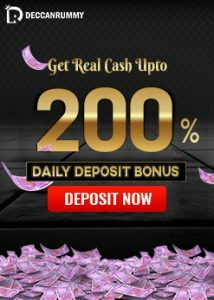 We make your time spent with us very exciting with awesome rummy promotions. Get rid of your stress and indulge in playing the game to your heart’s content. Not only will you relieve your stress but also have a chance to earn more. Playing Free rummy online will help you find some inner peace; keeps your spirit afloat. It’s a blissful escapism and moreover, it’s entirely free. You don’t have to pay a penny to play Indian rummy unless you opt to play cash games. There is a multitude of freeroll rummy tournaments that comes with a handy cash prize which you can try out. Deccan Rummy is committed to delivering the world-class rummy experience, providing quality playtime for all the rummy aficionados out there. We would welcome you with a most advanced gaming platform and a host of players across the country would be waiting to battle it out with you. So, the next time you have those one days where you feel the need to take a break and get your mind off everything, head over to DeccanRummy.com and start playing Indian Rummy Online. Do you have any other card games that you use to de-stress? Do not hesitate to reveal them in the comment section below.